The second step is to disregard that which can’t be easily measured or to give it an arbitrary quantitative value. This is artificial and misleading. The third step is to presume that what can’t be measured easily really isn’t important. This is blindness. The fourth step is to say that what can’t be easily measured really doesn’t exist. This is suicide. Named after Robert McNamara, the United States Secretary of Defense from 1961 to 1968, it refers to making a decision based solely on selected quantitative observations and ignoring all others. The reason given is often that these other observations cannot be proven. 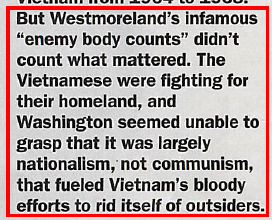 Interestingly, when McNamara’s counterpart at the time in Vietnam Vo Nguyen Giap, died in 2013, Time Magazine put out an article on that event. See the quote in the picture to prove the point. When you think you are winning based on body count, you forget that nationalism can be a much stronger driver. It seems that McNamara changed his mind towards the end of the war, and his change of mind was not welcomed at all. An illustration of false consistency – once you say A, you have to say B as well. The combination of the Phallacy and false consistency is really suicide. In addition, the human lack of capability to deal with things that are delayed in time, is another nail in the coffin. Why I am compelled to write about this? To raise your awareness and embark you on a quest to weed these out. On the one hand, I think it is one way humans deal with complexity. It is compellingly simple. Once we identify a target that we believe to be a root cause for something, we forget everything else, and we cling onto that target as if that is the last thing in life. We sell it as “keeping things simple and pragmatic”. Heaven forbid we admit that we do not understand what is really going on. However, on the other hand, “Everything should be as simple as it can be, but not simpler,” is a quote attributed to Einstein with a lot to truth. We have the biggest brain of all mammals, and at least got the potential to use it. We should not put our future in the hands of others without applying some scrutiny. We have to connect the left hand with the right hand. In medicine and healthcare. We take one, easy to measure way of treating a disease as the only way, ignoring other ways, because they cannot (or have not) been proven. Seen in cholesterol, cancer, fat, and thyroid fallacies. Measuring simply the rise of diabetes and trying to treat it, while ignoring the food recommendation of governments and nutritionists. In politics. Politicians run with an easy number, ignoring anything else. An example – unemployment numbers fallacy, where we modify the definition e.g. into a Harz IV number, disregarding the damage to human dignity and potential. We cannot prove that Harz IV people can develop, therefore it is not important. In country budgets. where we drain one area of society for the love of another (benefit of education cannot be proven, military numbers are easy to count). In agriculture. where we overproduce what makes us ill, and by not declaring what is in the (GMO, chlorate, cadmium) tin, we can easily ignore the consequences. In monetary policy. where we fell in love with inflation as a measure of success, and now that it disappeared, we start to call it negative inflation, in stead of deflation. In employment policies. Ignoring that we import deflation with cheap Asian goods and cheap labor from eastern Europe, easily measuring company profit, ignoring unemployment of men 50 years and older. In the workplace, where the influence of stressful leadership is not easily measured (ignoring the number of people off sick or with burnout), and relaxation chairs are installed. Now there is truth in the difficult side of complexity and the limited extent of being able to deal with it. Elliot Jaques defined in Requisite Organization “time span of discretion” as a measure of employee responsibility. The challenge being, that at the top of an organization you need someone that looks ahead far enough, for a CEO for example, 50 years. A reason we all get paid in relationship to the complexity of the job. Very few people can look far ahead, however, and most people like to limit their outlook to a day or week. Not particularly a basis for sustainable decisions in life. And here is the dilemma. When politicians (and line managers, for that matter) do not stay in office more than 3-4 years, what can you expect? They will never live with the consequences of their policies, because of their financial parachutes. Still, there is something we can do. We can pay attention, so we do not pay with pain*. Each time when someone calls out an easy number as important, become suspicious. Stop and Think. What is on the other side of that? What is outside of this box? What else is out there, which is potentially more complex, and being ignored? Ask questions. Uncover. And when the answer is: “that is too difficult” or “that is not proven” or “we have no time for that” or “we have to be pragmatic” you know you are dealing with a MacNamara phallacy, and you are likely being misled. And watch out for false consistency. As soon as you recognize you are on the wrong track – get out, do not follow through. So many people I coach admit they married the wrong person, or got into the wrong job. A sad fact that can be avoided if we pay attention. I wonder whether you start to see these Phallacies entering your awareness right now? Which ones do you see?